On January 10, 2016, we went to Temple University after school. People who were on the inspection team left 1 period before school ended and took all of the materials + the robot to Temple. 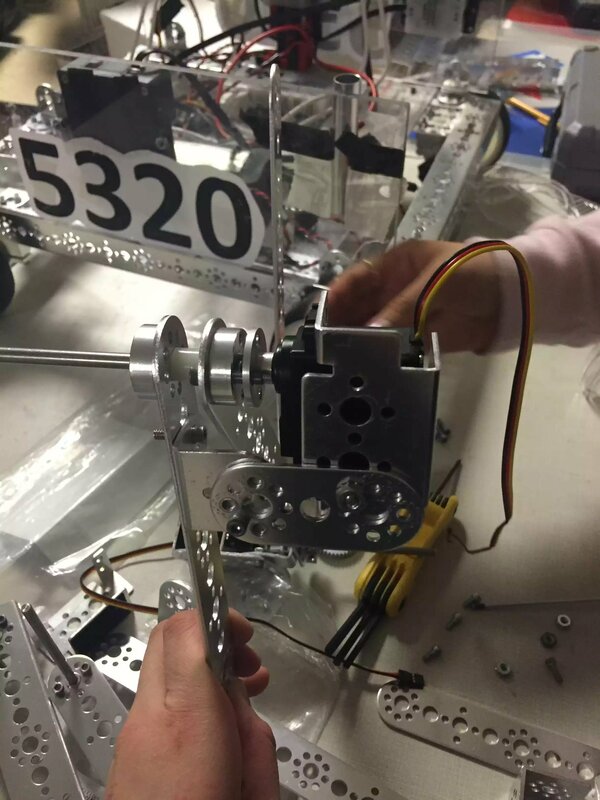 The mechanical subgroup added a mechanism to press a lever on the field but it ended up passing the 16x16x16 inch size limit. We tried to drive it but only 1 motor worked. We worked with Jim to figure out what was wrong with it again. It turned out that the wires weren’t crimped properly so we had to fix the 3 wires connected to the 3 motors that didn’t work. At first, we thought it was a programming error but then we noticed a faulty wire connecting the battery to the motor control turning on and off. It would turn off every time someone touched it so we checked if the other wires had the same problem. 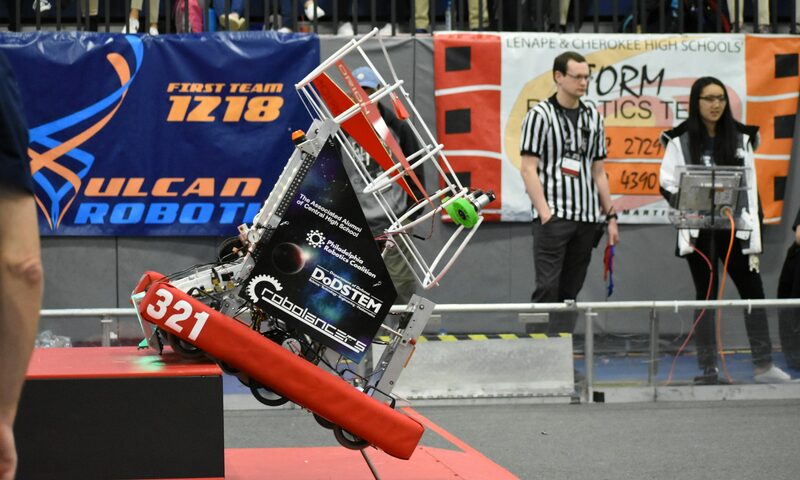 After we fixed it, we had the majority of the wheels working but it was about time to leave so we had a last minute scrimmage with our counterpart, Crimson. We scored 5 points while they scored 47. 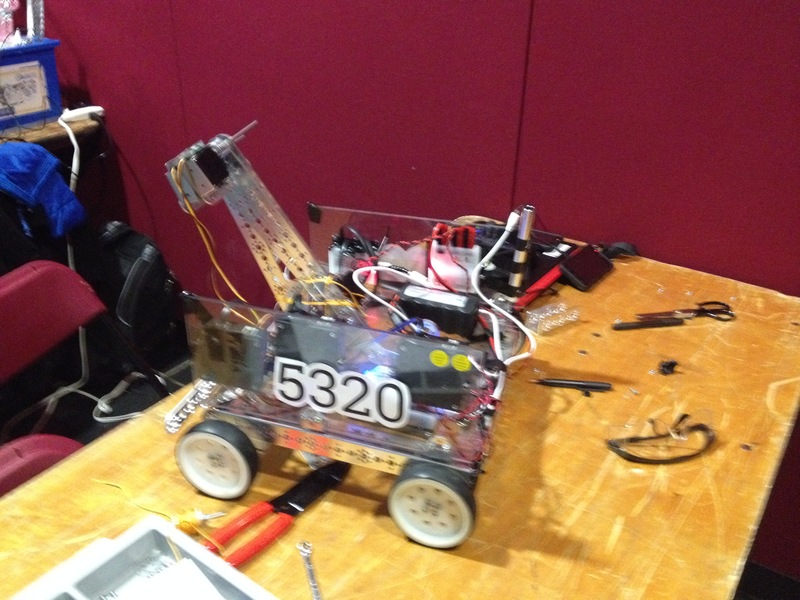 Our phone on the robot ran out of power and died 40 seconds into the scrimmage. Blocks also got stuck under the robot. We packed up and came back the next day at the same time. This time, we fixed all of the wires and the phones were charged. The robot wasn’t driving properly. It was reversed and we couldn’t turn properly because the motors weren’t programmed to the right ports. To reverse the wheels, we just reversed the wires in the ports so that the – wire went into the + port and vis-versa. We were in 2 scrimmages. In 1 scrimmage, we had to hold the controller upside down because the robot’s controls were reversed. The turning still wasn’t working. We almost got up to mid-zone in that scrimmage. In the second one, we quickly reversed the controls so we would be able to to hold the controller properly but that caused us to not be able to turn at all. We stopped moving for approximately a minute but we couldn’t get onto the climbing zone. After that, we worked on the program until it was time to leave. Overall, it was a good experience. It taught us to be more prepared and to plan head.